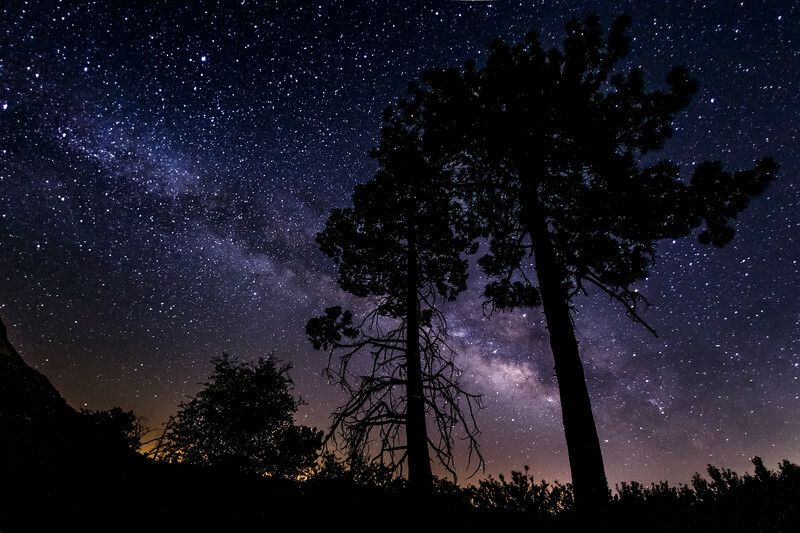 The Milky Way rises among some pine trees in the Paso Picacho campground of Cuyamaca Rancho State Park. This is a single frame for a time lapse shot at f/2.8 30 sec ISO 3200. Canon 6D and Sigma 15mm EX DG. Cuyamaca Rancho State Park is a state park in California, USA, located 40 miles (64 km) east of San Diego in the Laguna Mountains of the Peninsular Ranges. The park's 26,000 acres (11,000 ha) feature pine, fir, and oak forests, with meadows and streams that exist due to the relatively high elevation of the area compared to its surroundings. The park includes 6,512-foot (1,985 m) Cuyamaca Peak, the second-highest point in San Diego County. The name "Cuyamaca" is a Spanish version of the name the native Kumeyaay peoples used for this place. In water-short Southern California, the Indians called the area Ah-Ha Kwe-Ah Mac, meaning "the place where it rains."